Shwethalyaung Buddha is 55 meters long and 16 meters tall. Local traditions set the construction of the Buddha in 994 during the reign of Mon King Migadepa. There are not many ancient literatures that talk about it during those times, but in 1757, historical records tell of the time when the revered city of Bago was pillaged by foreign intruders. The Buddha was apparently lost under thick vegetation only to be discovered more than a century later by the ruling British in 1880. The Shwethalyaung reemerged from a thick covering of jungle outgrowth when it was accidently discovered by workmen who were clearing the jungle to build a railway line. Restoration of this gigantic image ensued immediately in 1881. The overgrowth was completely cleared after some time, and in 1906 a pavilion or “tazaung” was built in front of the image to protect it from any further weathering or damage. In 1930, the Buddha’s mosaic “pillows” were added to the left side of the image. Myanmar is home to another colossal Buddha, the Kyaukhtatgyi Buddha in Yangon. 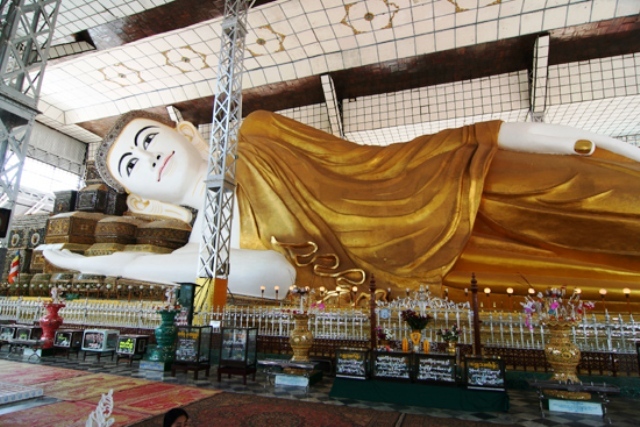 It is bigger than Shwethalyaung, but the Reclining Buddha is older and more artistically rendered. The Lord Buddha is portrayed in several positions to represent his different teachings and periods in his life and journey towards enlightenment. Generally, a Buddha in the reclining position is called the Parinibbana Buddha, which represents the Buddha at the moment of death when he leaves the body and enters the final stage of nirvana or complete enlightenment. This stage means that someone will not anymore reenter the cycle of rebirth as they have been completely freed from all sufferings and karma. This is the ultimate goal of every Buddhist, which is why a Reclining Buddha is approached with much reverence and awe. A Reclining Buddha image is always in a peaceful posture and with a smile on its somber-looking face. The Shwethalyaung depicts the Lord Buddha on the eve of entering his own nibbana (nirvana). Shwethalyaung Buddha is found to the west of the modern and tourist town of Yangon, which is the most commercially busy city in Myanmar. A temple complex has been built surrounding the image to maintain the area, protect the Buddha and improve the religious and tourist value of the Shwethalyaung. Sadly, the temple is now surrounded by pressing hawkers selling all sorts of souvenir items, antiques, and other wares. There are also vendors along the route leading to the Buddha.